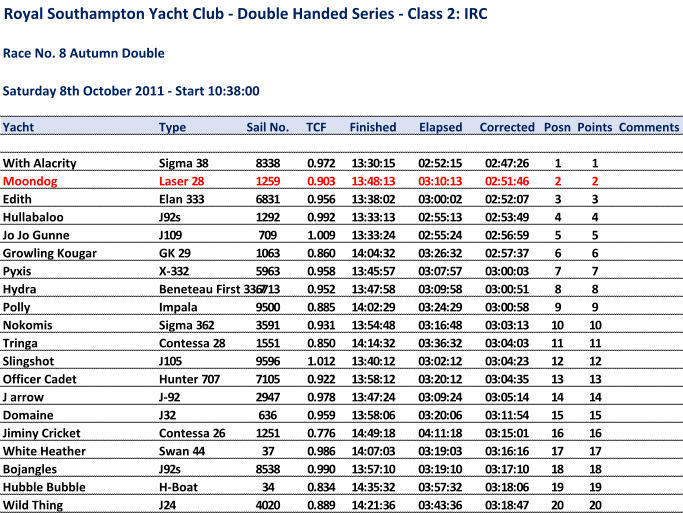 Heavily biased line so we started at the pin end with most of the fleet at the wrong committee boat end. Decent beat to the first windward laid mark and were about third boat round for the short leg to West Knoll. Long downwind leg against the tide to Bob Kemp and decided to head over to the central Solent to get out of the worst of the tide but most of the fleet stayed towards the Island side and not sure which one paid off. Beat back to West knoll with the tide and again seemed to be doing pretty well and keeping up with the bigger boats and overtaking some. Close call with Red Machine but no paint swapped and all sorted out in the bar afterwards. Short downwind leg to Sunsail Events before downing the spinnaker to the finish at Universal Marine. Thought we had done fairly well but always difficult to tell with a lot of low raters in the fleet but looks like it was not there day as we got second in class 2 combined and first in Class 2B for a good finish to the season.